SCVHistory.com GA4502 | Hart High School | 9th Grade, Group B (2 of 3), 1945-46. 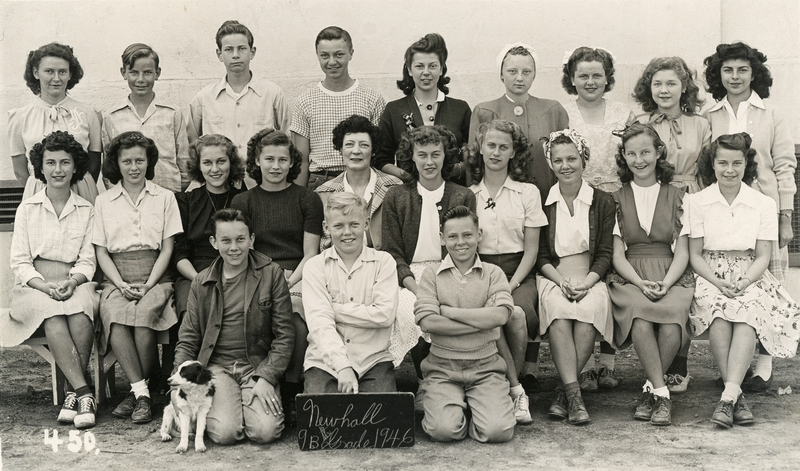 Hart High School 9th grade class, Group B (2 of 3), 1945-46. Hart, the Santa Clarita Valley's first high school, opened in 1945 with (only) 9th graders from all corners of the SCV. In 1945-46 they were housed on the Newhall Elementary School campus, where this photo was made; the separate high school was not yet built. These 9th graders went on to become the first Hart High graduates in 1949 ... the famous '49ers. Top row: Jean Anson, Bob Green, Carl ?, Jerry Wiles, Grace Clemmens, Joyce Carlson, Patsy Rhine, Lois Boyd, June Vasquez. Middle row: Cherie Brigham, Nancy Kessinger, Martha Hitchcock, Merilyn Wald, Mrs. Pfister, Ardis Stewart, Kathleen Burchert, Joan Ludlow, Jean Looney, Gwen Booth (the photo contributor). Front row: Maurice Doty (with dog), George Kroller, Olen Hull. Photo from the collection of Gwen Booth (Gallion), Class of 1949, and Dean Gallion, Class of 1950. Gwen Booth was a member first class to attend and ultimately graduate from the Santa Clarita Valley's first high school, William S. Hart High, in 1949. When she entered as a ninth grader the year it opened, 1945, the school was located on the campus of Newhall School (which went through eighth grade) at Walnut and 11th streets, and it wasn't called Hart. It was called Santa Clarita Junior and Senior High School — Santa Clarita being the diminutive form of the local river's name, by which the valley was known. The school district, created by a vote of 1,184 to 7 earlier that same year, was called the Santa Clarita Union High School District. Its only school opened with one grade level (9th) and added a grade each year until the freshmen of 1945-46 became the seniors of 1948-49. Gwen, a cheerleader, would go on to marry her high school sweetheart, an athlete from Saugus named Dean Gallion of the Class of 1950. But first, there was work to do. Gwen was a member of the student council and the committee tasked with selecting the mascot and school colors. The committee picked maroon and grey for the colors — which changed, according to Fred Trueblood III, in 1964 to red and black because the maroon hues were too hard to match in sports uniforms and cheer outfits. According to Nanette Lagasse Gaither (Class of 1968), it was June of 1966 when the colors changed, on a vote of the following year's juniors and seniors (Classes of 1967 and 1968). Back in 1946, after surveying the mascots of other high schools in nearby communities, Gwen's committee settled on "Indians." "In the late 1940s all the mascots were animals or people," Gwen explained in a 1997 interview. "We thought about the Panthers, but there weren't any panthers around here. We wrote on a chalkboard all the school colors and nicknames of every school that we might be in a league with, and nobody had 'Indians.' We wanted a name that would sound good in a yell, too, and with three syllables it was an easy one to put in a cheer." Gwen said the committee felt the name was appropriate because "the Indians were our explorers, and there was certainly nothing wrong with being Indians. There was an Indian settlement at Castaic, and at the Highway 126 junction, and at Agua Dulce." Minor grumblings over the mascot pertained to the notion it was "too common," according to editor Jerry Wiles, writing in the first edition of the school newspaper, The Smoke Signal, in March 1946, long after the selection was final. Next came the school's renaming. "Santa Clarita" was a new grammatical contruct recommended by historian A.B. Perkins in the 1940s while the school district was forming. You really couldn't have two "Santa Clara" high school districts in California — there already being one up north, complete with a "Santa Clara High School" that opened in 1872. We'd have lost in a boxing match to our northern namesake, so we gave up our claim. But "Santa Clarita" took forever to catch on. Folks didn't like it. So in August 1945, as the first school year was starting, the school board approached cowboy actor William S. Hart, who had donated money and land to the construction effort, and asked permission to use his moniker. Newhall's most famous citizen initially felt unworthy but ultimately acquiesced. Gwen remembers that the school and the district officially changed their name in March or April 1946, just a couple of months before the actor's death on June 23. By that time, Gwen's committee had already settled on "Indians." The mascot came first, before the school became "Hart." And that's whey they aren't the "Hart High Cowboys." GA4502: 9600 dpi jpeg from original 3x5-inch print, collection of Dean and Gwen Booth Gallion.